Uesco Cranes, one of the largest manufacturers of pre-engineered and custom-engineered overhead crane solutions in the United States, offers several different configurations of single girder cranes to fit any application or environment. 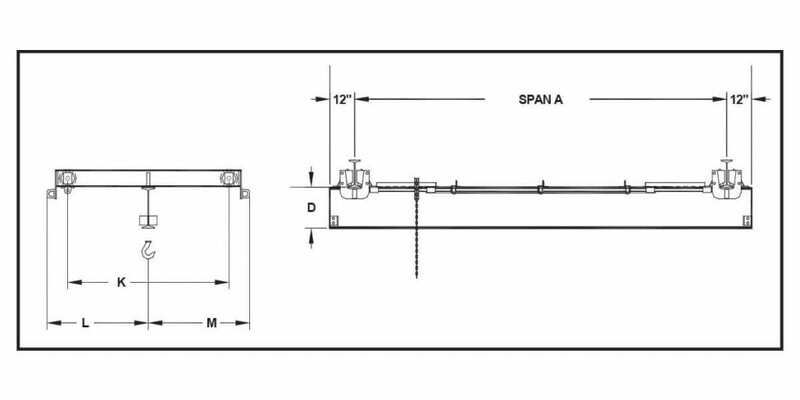 The single girder, under running, hand push crane line of products feature 1-ton and 2-ton capacities. This line of cranes does not require electrification, and it is ideal for applications requiring no risk of sparks, where electric motors are not required, or where electricity may not be readily available. Each of these cranes has 4″ diameter machined steel wheels and have a crowned or flat tread for operation on a standard S-beam, wide flange beam, or patented track. You may use a variety of hoist types, but frequently hand chain hoists and lever chain hoists are preferred options with this type of crane. DIM. D: 9" 9" 9" 9" 11" 11" 13"
DIM. D: 11" 11" 11" 11" 11" 13" 15"